Pros: Sensitive and beautiful choreography. A thrilling musical score. Cons: Even a group of idealists like Amici could not conceive of an ending where the residents won their battle legitimately! Amici are celebrating 35 years of creating dance theatre with an ensemble of able-bodied and disabled performers. Their anniversary show, 35 Amici Drive, tells the story of a group of vulnerable residents who have found sanctuary and community in a run-down council block, and are now fighting to save it from demolition. While the symbolism may be a bit heavy-handed, there is no mistaking the accuracy of the message that Amici has provided a haven for a diverse group of people to express themselves, feel valued and share a sense of purpose. The curtain goes up on a construction site, with a skip to one side and a scaffolding platform to the rear of the stage, where the head of the residents’ association is on the phone to his unsympathetic MP. The politics of the piece are pretty quickly established; this is the little guy fighting to make his voice heard over the siren calls of the monied developers. Here again, the message lacks subtlety, and there is something a bit pantomime about the opposition between residents and council, particularly in the final scenes, but anyone who has had any dealings with the British planning system will know that it’s not entirely far-fetched. The cast is split into two groups, with the residents occupying one side of the stage and the baddies – councillors, developers, security men – occupying the other. Through a series of set piece dances we are introduced to some of the residents, watch the councillors deliberating, and see the clashes between protesters and security. There is huge variety in the style, scale and sophistication of the dances. I was particularly taken with the joyful Four Sisters Dance, with the Abused Woman Dance, in which a wheelchair becomes a thing of beauty, and with the whole-cast dances. In the Amici Arms Stick Dance the opposing groups fill the stage and perform a stylised but very vigorous fight with large sticks. It looks like a crazy thing to attempt with forty performers of any kind, so to make such an exhilarating success of it with a group that includes vulnerable adults, people in wheelchairs and with motor dysfunction is quite astonishing. In this and all the dances, what shines through is the judgement that has gone into matching performers with roles, and into choosing the choreography that is appropriate for each person’s capabilities. Nowhere is this more true than in the case of Francis Majekodunmi, who plays a little lord of misrule, in a white disco suit. He is a natural mover, and whenever he sidles hesitantly into view there is a sense of anticipation, both to see him dance and to see how he’ll mix things up. The music is a driving force in the show. It is intense, dramatic, urgent, and in the case of the live music provided by Nao Masuda and Jenny Adejayan, is watchable in its own right. Percussionist Masuda plays the Taiko drums with a such energy and physicality that it is almost a show within a show. My evening at the Lyric was a moving experience that left me with lasting impressions: Roy Peirson’s nervous grin as he shimmied across the stage playing a hipster; the radiant smile on Etsuko Tanaka’s face whenever she danced, and the moment when tealady Michelle Minner finally stepped out of the shadows for a brief dance, centre stage. 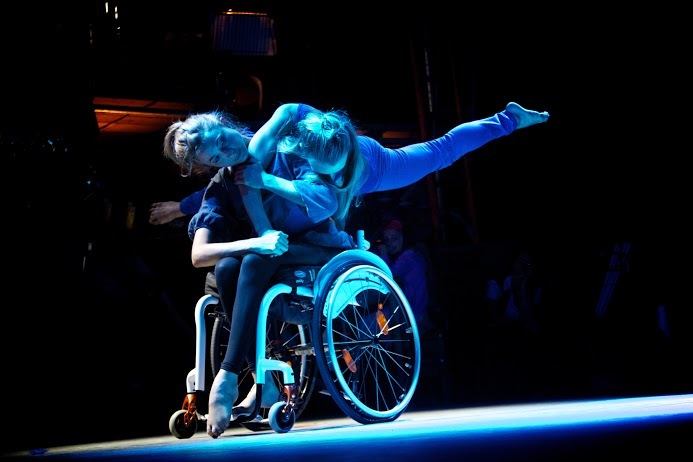 Nor will I forget the interaction between able-bodied and disabled dancers, where the able-bodied helped and supported the disabled just as much as they needed. It is a welcome reminder of how much more disabled people can achieve when the able-bodied are confident enough not to assume what they can’t do, but to ask what they can do, and what more they could with a little help. Booking Until: This show has ended its run.